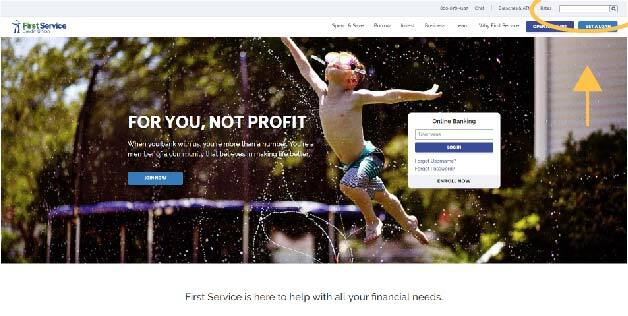 We are excited to present to you the new First Service website. One of our priorities at First Service is to offer our members not only the best products and services, but also the best resources. We have been working hard behind the scenes to update our website to make it more user-friendly and an excellent online resource. Take your time, look around, and enjoy the new and improved site. We hope you enjoy your time here, and please let us know if you have any questions. You will still find the online banking login in the same location with no changes to that portion of the site. On the homepage, enter your username in the field on the right side of the main banner. Your online banking experience will remain the same as before the launch of the new site. In the top right corner of the window, you will find a search bar. Enter a key search word and a list of results will appear in order from most to least relevant.